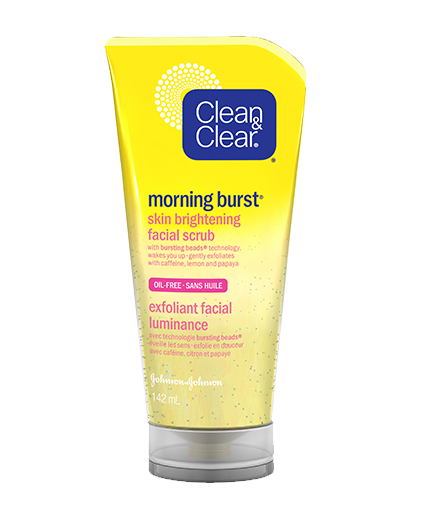 MORNING BURST® Skin Brightening Facial Scrub is formulated with BURSTING BEADS® and a unique blend of caffeine, lemon and papaya. It invigorates your senses and helps brighten your skin’s appearance. Skin appears instantly refreshed and leaves you ready to face your day. Using clean hands, splash water onto your face. Squeeze a small amount of exfoliating scrub onto your palms. Gently massage scrub over your whole face, avoiding the eye area. If you get some in your eyes, rinse them out thoroughly with water. Rinse off your face and pat it dry with a towel. Water (eau), Glycerin, Sodium Laureth Sulfate, Acrylates Copolymer, Polyethylene, Phenoxyethanol, Lauryl Glucoside, Caprylyl Glycol, Sodium Hydroxide, Menthyl Lactate, Tetrasodium EDTA, Cellulose, Mannitol, Xylitol, Methylparaben, Propylparaben, Polygonum Fagopyrum (Buckwheat) Flour, Ethylparaben, Polybutylene Terephthalate, Simmondsia Chinensis (Jojoba) Seed Extract, Caffeine, Citrus Medica Limonium (Lemon) Fruit Extract, Carica Papaya (Papaya) Fruit Extract, Algin, Tocopheryl Acetate, Hydroxypropyl Methylcellulose, Ethylene/VA Copolymer, Mica, Titanium Dioxide, Talc, Chronium Hydroxide Green, Iron Oxides, Yellow 10, Parfum. Hello victor1988! Thank you so much for taking the time to leave a review! As it is not typical of our product to make your skin rough to the touch, we would love to speak to you directly to gather some additional information. I invite you to call our Consumer Care Center at 1-800-661-4659. We are open Monday to Friday, 8 a.m. to 8 p.m. ET and we will be happy to assist you. I am so in love with this product. Smells great, feels great, and leaves my acne prone skin clean, clear, hydrated, brightened, awake and refreshed. Love love love! I have extremely oily skin which breaks out quite often. Most face washes either do not remove the oil completely or dry out the skin completely. This one does an excellent job, with a balance between the two. Love it. Excellent product for the right price. Gentle exfoliator is great in the mornings! I use it at night too. It's my favourite product! im in love with this stuff! seriously, i use morning burst every single day. im such a grump in the morn and washing my face can be a negative task, but i actually ENJOY the feeling of this in the morning! hooooooray! i love it! Sent super bon et laisse la peau douce et fraîche.